A colourful and entertaining look at nature is presented at Palmitos Park, a botanical garden, zoo and aquarium situated four miles (6km) inland from Arguineguin on the south coast. The park is a subtropical oasis containing thousands of birds, fish, animals, trees, plants and particularly orchids. The orchid house is the largest in the Canary Islands and the range is astonishing. 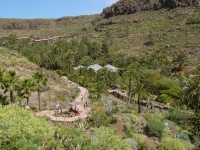 There is a cactus garden too, a huge butterfly house and an aquarium featuring a recreated riverbed. Attractions include dolphin shows and a number of bird shows including displays by birds of prey, parrots, and exotic birds. The park also houses a selection of reptiles and other animals including aardvarks, wallabies and meerkats. Another highlight is Primate Island, which is inhabited by entertaining gibbons and orangutans. There are numerous picnic spots and view points in the park, which is blessed with some ruggedly beautiful scenery. There are also cafes selling refreshments for those who don't bring their own food. All displays and shows are included in the entrance fee. Check the official website listed below to see what time all the different animals perform. There is a substantial reduction for online booking via the website. Opening times: Daily from 10am to 6pm (last admission at 5pm). Admission: €29 (adults); €21,50 (children aged 5 - 10); €8 (children aged 3 - 4).